Gary Hustwit will make you care about things that are so mundane and minute in our lives that we are unaware they exist – let alone thought about. Hustwit has managed to created two feature length documentaries that are very compelling to view. Upon hearing the premise of these films, one could be forgiven for passing over them as ultimate monotonous viewing. However both films have a charming quality that make you really care about the topics handled by them. Helvetica is the history and impact of a typeface. Who knew that Helvetica had such a turbulent past and managed to carve out a niche for itself as the go to font for all kinds of media ranging from advertising to street signage. The film is narrated via interviews from those involved with the upbringing of the type as well as those who rely on it in their daily lives. As well as this – the film is punctuated with beautiful cinematography comprised of shots that I want to frame for my wall. 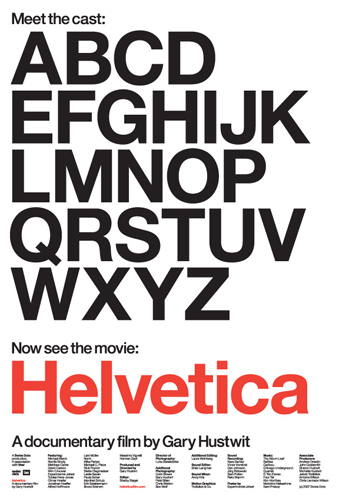 After watching this documentary I was educated and informed that whenever I click the drop menu to select a font – it will always be Helvetica. The next film by Hustwit and spiritual successor to Helvetica is Objectified. This film examines modern design – again looking to its roots and discovering those who design for a living. Objectified looks to the behemoths of industrial design, (predominantly Apple) and finds out why good design is so effortless that it should go completely unnoticed. Again the film is a seamless work of cinema design itself. It is filled with colourful pans and daring closeups that really help accentuate what the design buffs narrate throughout the film. The two films are great watch for anyone with even the faintest interest with either topic covered. However I do not believe you need any interest in them to enjoy the documentaries. By the closing credits, you will have an interest. This is a demonstration of the filmmaker’s wonderful talent as well as the genius subject matter of the two films. The Awesome Geek loves good design and good fonts, Helvetica and Objectified are mandatory viewing. This entry was posted in Film and tagged Design, Documentary, Font, Gary Hustwit, Helvetica, Objectified, Typeface by Jonathan Day. Bookmark the permalink.